The Oasis Fine Linens Bamboo Sheets are not exactly what the name implies, but they are still great. These bamboo bed sheets currently have a 4.4 star rating on Amazon, but there are a few critical reviews that need to be addressed. Let's dig deep and see what these bamboo products are made of. The Oasis Fine Linens Bamboo Sheets, as I mentioned before, are not made of what the name implies. Instead of being made from bamboo linen as I had hoped, they are made from 100 percent bamboo rayon. Often called bamboo viscose, it makes up the majority of bamboo fabrics, and the best bamboo sheets, on the market today. Most rayon viscose is made using the viscose process. This involves dissolving the bamboo cellulose in a strong solvent. This then creates a pulpy solution that's forced through a spinneret and into another solvent that solidifies the cellulose strands into the fibers. The manufacturer uses this to make the thread and ultimately the rayon. Some of the chemicals used in the process of rayon include chlorine bleach, sodium hydroxide, sulfuric acid, and carbon disulfide. Due to this, the rayon bamboo tends to not retain much of the original bamboo. In fact, bamboo rayon sheets are required to be labeled as rayon made from bamboo. This is because in 2009, the FTC (Federal Trade Commission) found that rayon made from bamboo really does not retain any of the antimicrobial properties of the bamboo plant. In addition, it's manufacture is absolutely not eco-friendly as the process results in a lot of wastewater, along with harsh and toxic chemicals. This is not to say that rayon bamboo is a bad material, it is just the fact that the name kind of implies that they are made from linen. However, thanks to the bamboo rayon, these bamboo bed sheets are incredibly soft. With a 300 thread count, these bad boys are softer than higher thread count sheets and bedding, like 1000 thread count Egyptian cotton. The sizes are also very standard, but the deep pockets are nice. In every king size set, you get a flat sheet of 108 inches by 102 inches, a fitted sheet of 76 inches by 80 inches, and two pillowcases of 42 inches by 22 inches each. The fitted sheet also has deep pockets of 18 inches, which is above par when compared to some other sheets. These sheets are also available for mattress sizes from full to a California king. On top of that, each size comes in five different colors: storm, mist, earth, cirrus, and blue moon. These colors seem a bit ambiguous, so they are basically grey, light grey, brown/grey, white, light blue. The features for the Oasis Fine Linens Bamboo Sheets are all pretty standard for bamboo bedding. They are thermal regulating and moisture wicking. This means that they absorb moisture and radiate it back out, regulating body temperature by keeping you cool when it is warm and vice versa. The care level for these sheets is rather low, which is great. They are both machine washable and dryer friendly. Keep in mind that you need to wash these sheets in cold water with no bleach and a mild detergent. When drying these sheets, let them tumble dry on low heat. If you remove the sheets immediately, you won't have to worry about wrinkles, which is another great feature. Of course, they are also hypoallergenic. On top of that, they have a 100 percent satisfaction, lifetime guarantee. Basically, this is a lifetime warranty on the sheets. If anything happens to them, you can send them back for a brand new pair or credit toward another set. This makes for very confident buying. Oasis Fine Linens presents their cashmere-soft bamboo rayon sheets. In development since 2007, their new Island Bamboo Collection is designed to withstand daily abuse and provide unmatched comfort year after year. They are so confident you will love their bamboo products that they offer a 100 percent satisfaction guarantee. Their specially-developed bamboo-derived rayon sheets offer unmatched softness and silk-like sateen weave drape, excellent moisture-wicking, and insulating properties for all seasons. These sheets are hypoallergenic and perfect for those with allergies, eczema, or sensitive skin. 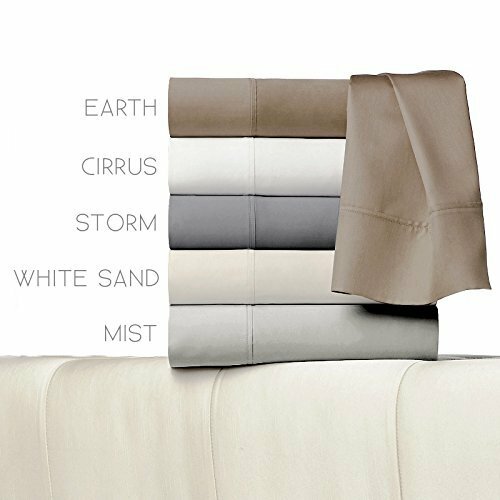 The Oasis Fine Linens Bamboo Sheets incredibly soft and durable when compared to other higher thread count sheets and bedding. This is thanks to the 300 thread count, 100 percent bamboo rayon that they make the sheets from. Rayon rivals the softness of the softest materials out there. The availability of these sheets is pretty high. You can get the Oasis Fine Linens Bamboo Sheets for any bed size, from a full size to a California king size. There are also various colors to choose from, but they are all fairly standard. The level of care is pretty low for these sheets. They are both machine washable and dryer friendly. Just remember to use cold water. They are even wrinkle resistant as long as you remove them as soon as they are dry. What's more, is that they have a 100 percent satisfaction, lifetime guarantee. Basically, this is a lifetime warranty on the sheets. If anything happens to them, you can send them back for a brand new pair or credit toward another set. This makes for very confident buying. There have been many people complaining about the quality of the sheets. Specifically, people have commented that the color of the sheets either bled after they were washed or there was some discoloration when they received the sheets. Additionally, people have complained that the sheets are actually fairly heavy, rather than light and breathable. This is very unlike most bamboo bedding as they naturally tend to be lighter given the fabric the manufacturer makes them from. While the heaviness of the sheets can be chalked up to personal opinion, the color issue seems to be the biggest and most concerning issue with these sheets. Color bleed can be a serious problem, especially if you had just bought them. It can even end up ruining the sheets if the bleed is enough. This seems to be the most common issue among the critical reviews of this product. However, given that there is a lifetime guarantee, if anything does happen to the sheets, you can simply get a new set. Hopefully, you can do this without much of a hassle. From looking at everything surrounding these sheets, it seems like they are pretty decent sheets. However, the color bleed may pose an issue. However, it is unknown if this is a regular problem or an isolated one. Nevertheless, if you want to try them out for yourself, you can grab them on Amazon for $129.99. For any other information, including the best bamboo sheets and bamboo sheets reviews, head on back to Green and Growing. Here are some top questions that I found for people seriously considering buying the Oasis Fine Linens Island Bamboo Collection. What kind of material are the sheets? This bamboo bed set is 100 percent bamboo rayon. What mattress sizes do these sheets come in? You can buy sheets to fit a full-sized bed to a California king bed. What is the biggest complaint with these sheets? Several people complained that the color bleeds when you wash them.